MTG Duel - word games - Furtopia | Family Friendly Furry Forum and IRC Chat! Not sure how well this game will work, but willing to give it a try. This game is all about dueling with Magic The Gathering cards. All expansions/cards may be used. 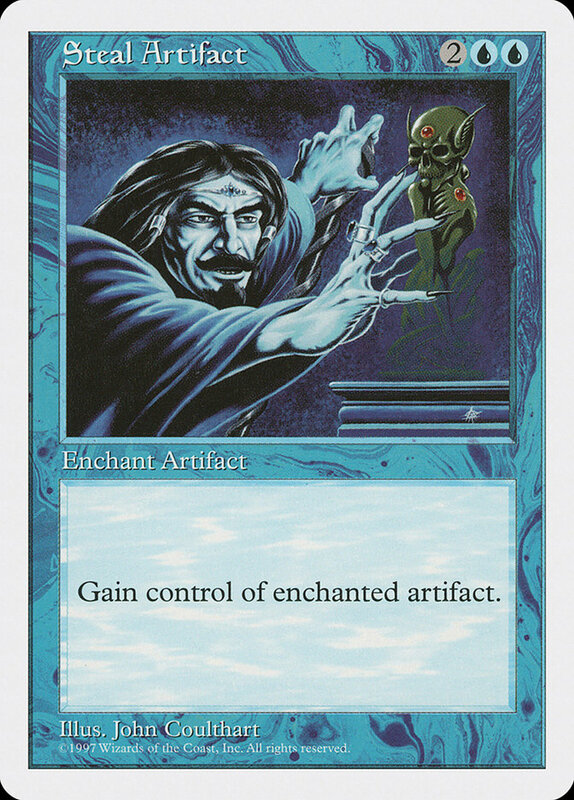 Please use only canon/authorised MTG cards. No "made up" cards/abilities allowed. For example, I'll start by posting Shivan Dragon. The next poster after me counters my Shivan Dragon by posting a MTG card or card combo of their own. Not only does the next poster have to counter my Shivan Dragon, but they must also post another card or card combo for the next poster to counter. I start with a Shivan Dragon. Poster #2: ^ Counters my dragon with his/her own card/card combo. v Posts card/card combo for next poster to block. Poster #3: ^ Counters card/card combo from Poster #2. ..........and so forth and so on. Keep card images to no more than 500 x 500 pixels. If the image is too large, then post a link instead. Emrakul cannot be countered and has protection from all colour. Darksteel Plate is indestructible and makes creature it is equipped to indestructible. Equip Darksteel Plate to Emrakul, Emrakul is now indestructible as well. I take another turn, so I cast platinum angel. Opponents cannot win the game, and I cannot lose the game. Nice going, Loc. I think you just ended the game right there. It's been ages since I played MTG and I'm wayyyyyyyyy out of practice. I'm not even sure what card/card combo could counter that. I'll let somebody else try. The cards are not in standard any more as they are too old, and Emrakul is banned in EDH (although I'm not entirely sure why). But legacy and other formats? Completely fine. But not that powerful - There are legacy decks which can win technically before turn 1 starts. I have a deck that is built around this entire idea - Get out Emrakul and make it unkillable. Platinum angel is also out of standard due to age, but allowed in all other formats. The problem with running MtG in the way you are here is that there is no mana to act as a limiting factor. The first turn I cast in an actual game would have needed 20 mana of any colour to pull off. That would take a long time to set up, or need multiple turns (as a side note, there are ways to gain infinite mana, infinite turns, infinite creatures AND infinite counterspells. All from the same deck. I've done it. These are also completely legal in most formats). As another aside, I have a deck which legally "cheats" Emrakul into the game very early on. 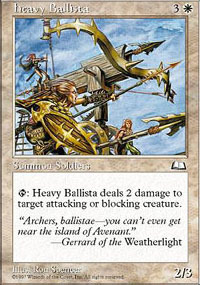 I should make a thread to list the horrible, murderous card combos I have decks built around. I used to be a Magic player like you, then i took an Eldrazi to the knee. Not sure if I'm doing this right, but let's see. First off, gotta take care of the angel with a trusty boulder salvo. ...followed up by equipping the Darksteel Plate to my wolf. 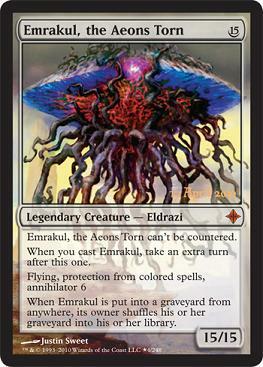 Next, I use Titan's Presence revealing my own Emrakul and exile yours. For the next player to counter I leave the Sacred Wolf equipped with the Darksteel Plate.